Fundraising: How Much Do You Know? Fundraising Series--Volume One is a comprehensive look at fundraising from a variety of strategies and perspectives. This bundle of summaries contains four (4) Page to Practice™ book summaries in one (1) set so you can compare and contrast thought leadership on this topic. LANO's General and Associate members receive free access to these and more than 100 other current titles, thanks to a generous grant from Blue Cross Blue Shield of Louisiana Foundation. And now with this new offering, Friends of LANO can download the same essential nonprofit management resources at an exclusive discount rate. The End of Fundraising: Raise More Money by Selling Your Impact by Jason Saul is an innovative approach that helps you create powerful value propositions to increase your leverage and improve the success of your pitches to funders. This book flips the fundraising paradigm and will have you identifying new prospects you may have originally dismissed. In Storytelling for Grantseekers: A Guide to Creative Nonprofit Fundraising by Cheryl Clarke, you'll learn why crafting a persuasive summary, packaging a compelling narrative story, and using a short story approach with letters of inquiry are the keys to securing your grant. Clarke also explores how storytelling can be applied to other forms of fundraising. Donor-Centered Planned Gift Marketing by Michael Rosen is a thoughtful examination of who makes planned gifts, how to assess your organization's potential for planned giving, and how to integrate planned gift marketing into your existing efforts. Naming Rights: Legacy Gifts and Corporate Money by Terry Burton instructs readers on how to benchmark and compete with peer organizations for buildings, spaces and named endowments. We told you about a virtual book club where CausePlanet and The Nonprofit Cultivation Center are partnering to give you a unique opportunity to discuss Page to Practice™ summaries with fellow nonprofit managers. Now, the first session of this Management Café starts on Thursday, April 3. It's available at your desk through facilitated webinar discussions. The sessions will discuss the summaries of "
The Power of Collaborative Solutions" by Tom Wolff, "Rippling" by Beverly Schwartz and "A Sense of Urgency" by John Kotter. Find out more about the Management Café and register here. Thanks to the Blue Cross and Blue Shield of Louisiana Foundation, LANO General and Associate Members can download these and other summaries for FREE! Simply log in at www.CausePlanet.org using your email address on file with LANO and "Password1". Then, click the "Summary Library" tab and download any title you like. If you have any questions, email us at Support@CausePlanet.org. LANO Member CausePlanet's popular Page to Practice book summaries are unique professional development tools that keep you informed about great books and best practices in nonprofit management. Any of the more than 100 summaries now available at CausePlanet can be downloaded FREE OF CHARGE in 2014 by General and Associate members of LANO, thanks to a generous gift from the Blue Cross Blue Shield of Louisiana Foundation. For all other LANO network members, CausePlanet now provides Page to Practice book summary bundles, each comprised of four carefully selected and combined summaries that bring you a comprehensive look at every facet of successful nonprofit management. CausePlanet's Summary Sets are priced at $23.95 to provide a volume discount equal to receiving four summaries for the price of three. Through our new partnership offer, all LANO network members can receive an additional 10% off this already discounted volume price. Click on the below links to learn more about or to purchase any of CausePlanet's new Summary Sets. Be sure to sign in with your LANO network profile to grab an additional discount! Now it's time to use them in a virtual book club at your desk! Discuss new ideas, best practices and recommended books with fellow nonprofit managers in facilitated discussions. CausePlanet is now partnering with The Nonprofit Cultivation Center to provide this unique opportunity we call the Management Café, starting on April 3 and continuing on the First Thursday of the Month through June 2014. See more about the Management Café and register here. Don't miss this innovative opportunity! LANO General and Associate Members: Download these Page to Practice™ summaries and more by logging in at www.CausePlanet.org using your email address on file with LANO and "Password1". Then, click on the "Summary Library" tab and download any title you like. Peruse CausePlanet's new Page to Practice™ book summary on Embracing Cultural Competency: A Roadmap for Nonprofit Capacity Builders by Patricia St. Onge. It tackles everything from exploring and embracing your own culture to addressing institutional racism. Thanks to the Blue Cross and Blue Shield of Louisiana Foundation, LANO's General and Associate (dues-paying) members can download this book summary and others for FREE at CausePlanet. 1. Log in at www.CausePlanet.org on the left panel, using your email address on file with LANO and "Password1". 2. Click on the "Summary Library" tab and download any title you like. Joe Waters, cause marketing expert, gives 40 specific, practical strategies in his new book that you can implement now to further your profitable relationships with businesses. Join us to learn more from author Joe Waters! Join me for a lively discussion via webinar on Thursday, March 27, with Joe Waters about his innovative strategies designed to do more with corporations. LANO members and friends can register for FREE, thanks to the generous support of the Blue Cross and Blue Shield of Louisiana Foundation. LANO members: Visit www.causeplanet.org/lano to download the free book summary by logging in with your email address and Password1. LANO members: Free download of new book summary "Fundraising with Businesses" is available! CausePlanet has just posted the new executive book summary of Fundraising with Businesses: 40 New and Improved Strategies for Nonprofits by Joe Waters. How do I download this new book summary? Simply log in at www.CausePlanet.org on the left panel, using your email address on file with LANO and "Password1". Click on the "Summary Library" tab and download any title you like. Don't forget, you can register to attend the author interview with Joe Waters on March 27 at 11 a.m. CST (all LANO Members and Friends are invited; link requires LANO network sign-in to register). Robbins' book help transform your leadership in just minutes a week. LANO members and friends can register for FREE thanks to the generous support of the Blue Cross and Blue Shield of Louisiana Foundation. LANO Members: Visit www.causeplanet.org/lano and download the free book summary by logging in with your email address and Password1. Suggest a book and enter to win a Nook! December is Read a New Book Month! 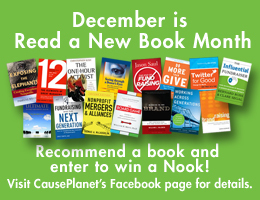 Join CausePlanet in encouraging one another to delve in a new book that will have you leading your nonprofit with fresh ideas. Simply suggest a book and enter to win a Nook e-reader! Post a relevant business or nonprofit title that you wish to read or recommend on our Facebook page and earn a chance to win a Nook e-reader! (Can't think of any titles? Hint: Visit our summary store for ideas! ) Deadline: 4 p.m. CST on Dec 31. Read more, register for our next author interview with governance expert Cathy Trower and download the free book summary of "The Practitioner's Guide to Governance..."
Special thanks to the Blue Cross and Blue Shield of Louisiana Foundation for providing every LANO member with access to CausePlanet's book summary library and author interviews.